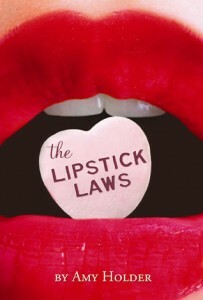 I have to admit that when I slipped Amy Holder’s debut novel The Lipstick Laws (HMH/Graphia, April) off the shelf, I was motivated mainly by the jacket summary’s similarity to Mean Girls. Packed with cliques, hot boys, revenge, and a tyrannical friendship pact sealed with a bright red kiss, The Lipstick Laws would be ripe for adaptation as a sequel to the 2004 film — if ABC Family hadn’t already released Mean Girls 2 in January. The Lipstick Laws lacks all of the wit of Tina Fey’s script and all of the substance of the movie’s nonfiction inspiration, Queen Bees & Wannabes by Rosalind Wiseman. Narrator April Bowers spends most of her time vapidly obsessing over boys and insulting the physical appearance of her classmates, making the reader wonder: what really makes her better than reigning queen Britney Taylor? April is sucked in, chewed up, and spit out by the Lipstick Lawlords, the popular clique headed by Britney. This drives unpopular April to plot a series of humiliating pranks to bring Britney down a notch or two. Though April finds a new group of friends and realizes some of her own shallow faults along the way, by the time she calls off her final prank — because she realizes it’s potentially lethal — readers will undoubtedly be rooting for everyone involved to sink into high school obscurity. Elizabeth Parks is a former editorial intern at The Horn Book, Inc.